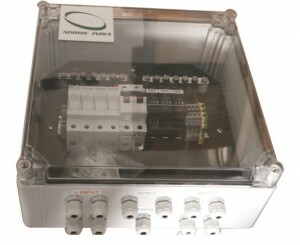 Nordic Asia offers array junction (DC combiner) boxes that provide interconnection between the input leads from the solar PV modules, and the output lead to the re-combiner box or inverter. 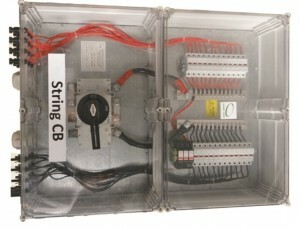 The combiner box is customized for different configurations, based on the number of strings of solar PV modules used in the PV layout. 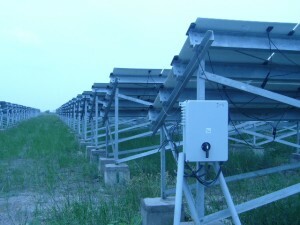 For a set of 10 PV modules arranged two in series and five in parallel, a 5:1 configuration combiner box is selected. 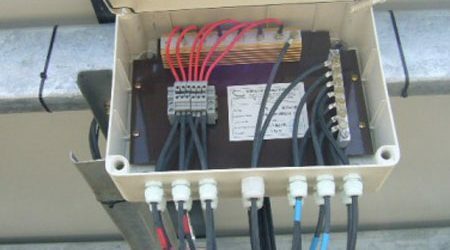 DC Disconnect/Isolation: An accessible disconnect/isolator switch is recommended for placement before the inverter to disconnect the DC side of the system when maintenance is being performed on the inverter.